We provide performers with a stage, PA system, lighting and an audience. It is a good opportunity to show off their talents gain publicity and attract followers. 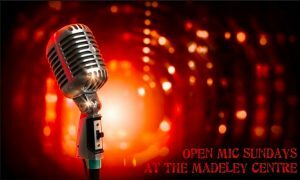 We ask audience members to make a donation to the Madeley Centre and buy raffle tickets, but there is no entrance fee. JustJane, our caterers, will open the bar and offer a snack in the interval. This entry was posted in Centre. Bookmark the permalink.